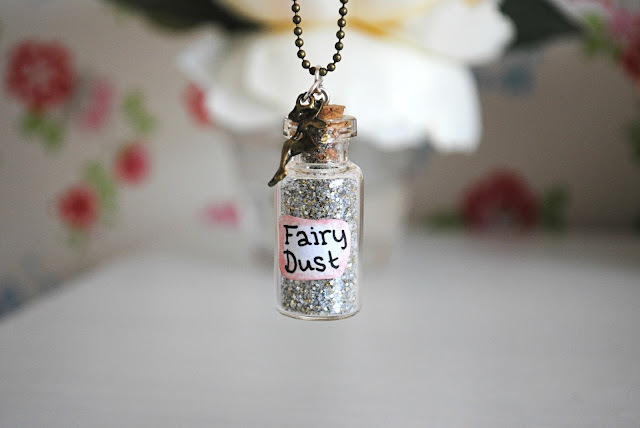 As you probably know, I'm a little bit infatuated with fairies, and I also have a big penchant for cute jewellery. 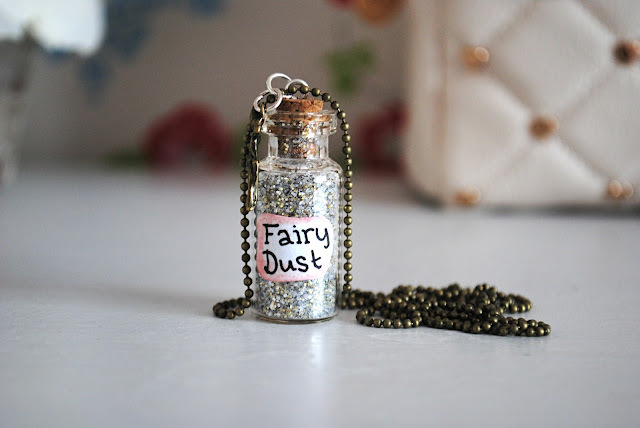 Naturally, it leads me to hunting out treasures like the fairy pendant I featured a little while ago, along with absolute beauties like this stunning Fairy Dust necklace from Ginger Pickle. I've been meaning to blog about this gorgeous necklace for ages now, it really is a unique piece and I absolutely love it. The chain is fairly long which I like, and it has a seriously cute and kitsch feel to it. 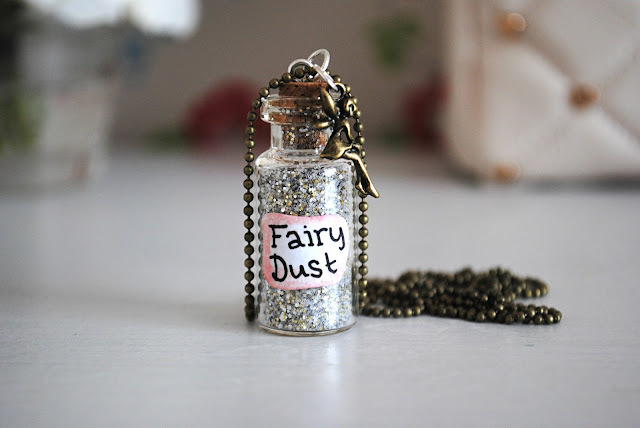 The miniature bottle is glass and filled with sparkling fairy dust, with a cute little fairy perched on the side of the bottle. I was sent it from the fab website Ginger Pickle, which sells tonnes of cute and unique jewellery and accessories. There are lots of animal-themed pieces, as well as a plethora of amaaaazing fairytale inspired jewels. 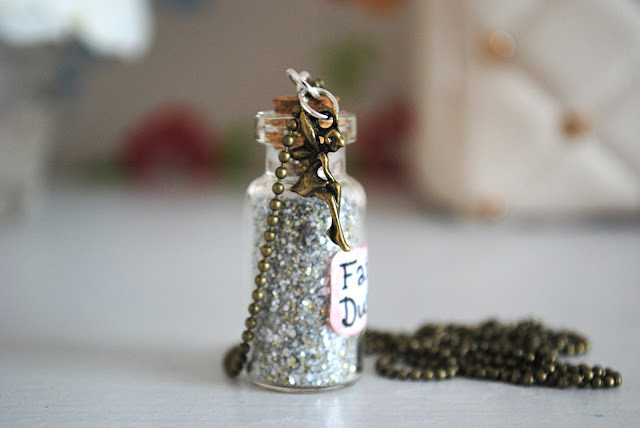 These are my favourites and I'm obsessed with all the gorgeous bottle necklaces, like my Fairy Dust one but with a different theme for each piece. There's a 'Somewhere Over the Rainbow' one, a 'Once Upon a Time' one, as well as loads of others I really want to get my hands on. I can see me building quite a little collection up of these, and I actually think they would make a pretty amazing fairytale charm bracelet with each of the bottles on - I know I'd buy it! The piece came packaged in a cute little lilac bag, along with a beautiful postcard that is pride of place on my pinboard. I love handmade pieces like these and wish I was creative enough to come up with ideas like this! I think the necklaces are a total steal at £8.00 too. Are you a fan of fairytale jewellery?